In 1993, the Oppenheimer Panhandle was the first product which we brought to market. Since then, it has become the defacto “Rock N Roll” handle in the world with nearly 2,000 sold. The original Panhandle for Microforce has been improved and has become a true system, allowing attachment of Preston, Arri and C-Motion zoom grips to most popular fluid heads, as well as being used as camera handgrips. The original OppCam Monitor Yoke Mount for the Panasonic BT-LH1700 was introduced in 2005. Since then, we have designed and built Monitor Yoke Mounts for the most popular field monitors including the newer Panasonics, the Cinetal, the Sony BVM-L231, and most recently Marshall and TV Logic monitors. 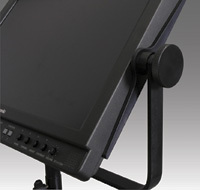 We also have a line of smaller Yoke Mounts for Panasonic, Sony, Leader, Marshall and TV Logic monitors in the 6-9" range. These mount to baby stands, or onto cameras. The newest addition to the system is our “Pivel” mount for on-camera viewfinder applications. The OppCam Carry Handle for the Angenieux Optimo 24-290mm lens was introduced soon after the introduction of this great, but heavy, zoom lens. Hundreds have been sold around the world. In September 2010, we were very pleased when Angenieux announced that our Carry Handles are their preferred systems. In addition to the Optimo 24-290, we also have a Carry Handle for the Optimo 17-80. We have built Carry Handles for the Fujinon E-Series 2/3" zoom lenses, and we now have a series for the Fujinon PL series of lenses. We are also building a series for the new Arri Alura zooms. Many years ago, we developed a system to use NP-1 style batteries on 16/35mm Aaton cameras. 10 years ago, with the introduction of the Aaton A-Minima, we developed a custom Battery Carry Handle for that camera. 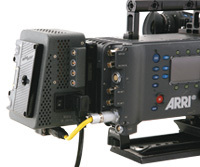 More recently, we have developed an On-Camera Battery System for the Arri 235 camera. This system powers the camera using an Anton Bauer or IDX battery, and the most popular batteries give at least twice the run time as the original Arri OB battery. 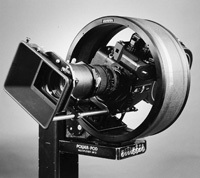 The OppCam Spin-Axis 360 Head was designed to provide “third axis” (rotation on lens axis) for almost any modern camera. Originally designed to mate to the Power Pod Classic, it also works well on gear heads and heavy duty fluid heads. The Spin-Axis 360 Head is both strong and lightweight, built from aluminum forgings and carbon fiber molded parts. Typical camera can “self center” on axis. The system is both flexible and very robust. OppCam has built a number of customized lenses over the years. These have included a series of Macro lenses in PL mount, and the OppCam/Nikkor 8mm Ultra Wide Angle in PL or BNCR mount. We currently provide the OppCam/Zeiss Contax 60mm and 100mm Macro lenses. These lenses will go 1:1 and match most Zeiss motion picture lenses. The OppCam Alexa OB AC Power Supply mates to the Gold mount or V mount on your Alexa. It provides 250 watts to fully power both the camera and the (4) accessory outputs on our sidecar unit. It is available either as the standard system, or with the addition of a battery piggyback that provides battery power should your AC source become disabled. Globally compatible. Now in stock. 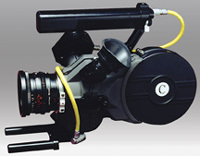 Further, we provide equipment and cameras for cinema, TV and corporate shooting. ©2014 Oppenheimer Camera Products. All Rights Reserved.